All armoring is NOT created equal. Though there are a number of levels of protection, the most common levels are Level III (high powered handgun protection) and Level V (high powered, non-armor piercing rifle round protection). 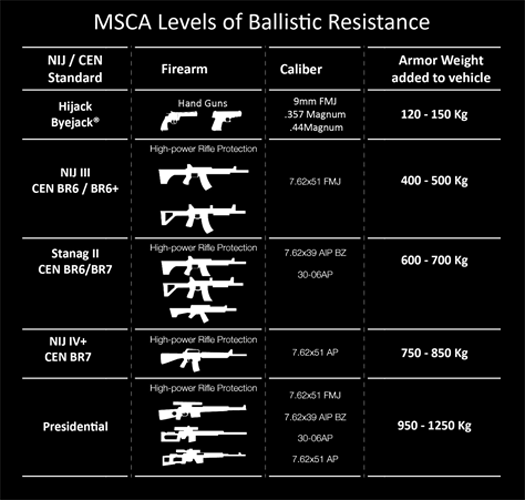 Ballistic standards are a material specification only. What most clients do not know is that as long as an armoring company uses independently certified materials which can defeat the international ballistic requirements, they will be compliant and can be certified as meeting that standard. But it is how these materials are designed and integrated in the vehicle for the overall protection of the passengers that is the most important factor.